Who Can Tell Me About Careers? Information about jobs that people do is all around us. Yet we usually miss it. For example, have you ever thought of asking your doctor questions like the following: Why did you become a doctor? What do you have to do to become a doctor? Where did you go to school? How did you choose which kind of doctor to be? What do you like best about your job? What do you like least? Many of us never ask these kinds of questions. But why not? Most people enjoy talking about themselves and will gladly give you answers. People all around you—family, friends, parents of classmates, teachers, and neighbors—can help you learn more about careers. Don’t be afraid to ask hard questions. Yet understand that the people you ask won’t be able to give you magic answers that make your decisions for you. However, the answers you get will help you find your own direction. What kinds of jobs did you have before this one? How have your previous jobs helped you in your current job? Do you need any special skills or education? If you had it to do over again, would you make the same choice? What advice do you have for kids who are interested in your career? Your school probably offers many opportunities for you to learn more about careers. It may even have a career day every year. Career days are special days when people from your community share information about their jobs, either at your school or when you visit their workplaces. Many people have careers that you would quickly think of if you were asked to make a list of jobs—lawyer, doctor, police officer, teacher, and so on. 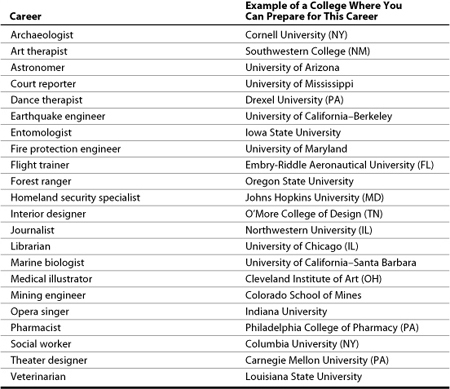 Others have careers you may not think of quite so quickly—editor, college registrar, Web master, criminologist, microbiologist, fashion designer, factory supervisor, or surveyor. Job shadowing provides another way to learn about specific careers. You learn more about careers by following (or shadowing) and observing people as they go about their day-to-day business. To learn more, go to www.jobshadow.org. If you go to a career day, talk to as many people as you can. Listen closely and ask questions. Some people have always known what they wanted to do. Others have made choices based on experiences and opportunities that came along. People often go in different directions than they expected. Some people want to be their own boss. Some prefer working for others, letting them worry about running the company. Some people want to travel. Others want to stay closer to home. Some people want to do a job that has little to do with their personal hobbies. Others want to combine their interests with their job. When Paul Bither went to college, he planned to study French. During his freshman year, his mother suffered a serious eye injury. This experience led Paul toward the sciences—and exploring eye care. After college, he went to optometry school. He is now an optometrist and specializes in helping patients who have low vision. What Kinds of Career Programs Are Available? Many business, civic, and professional groups and other organizations have programs that can help you learn about careers. Several government agencies have programs that can help, too. Some of these programs are offered at your school while others are offered at different locations. Such programs may help you explore a specific career (such as reporter) or an entire field (such as publishing). These programs include summer camps, mentoring (working one-on-one with an adult), school and after-school programs, jobs, tours, and activities that teach you leadership skills. Many of these programs, especially those run directly through your school, are free or low cost. Others can be expensive. Even these, however, often can provide financial help to students who need it. Southwest Airlines began its Adopt-A-Pilot program in 1997. In the program, which reaches more than 30,000 students in more than 1,250 fifth-grade classrooms across the country, classes “adopt” pilots. The students have special lessons in geography, math, science, aviation, and other classes. They learn what it’s like to be a pilot and also about planes, airports, and the different places the pilots fly. Space Camp at the U.S. Space and Rocket Center in Huntsville, Alabama, runs weeklong programs for different age groups. Activities include simulating a space shuttle mission and working in the International Space Station, using astronaut training equipment, and touring NASA’s space centers. The camp also offers programs for blind and visually impaired students, as well as deaf and hard of hearing students. For more information, call 1-800-63-SPACE or visit www.spacecamp.com. Two-year colleges offer a wide range of career programs. At Tarrant County College in Texas, your choices include automotive collision repair, construction management, dental hygiene, fashion merchandising, management, nursing, postal service administration, radio and television broadcasting, sign-language interpretation, and welding.